A new year of Ja Ja Ja is upon us, so grab tickets now to join us at our first Berlin show of 2019! We’re thrilled to be heading back to FluxBau after our winter break, and especially thrilled that 3 exquisitely good new artists will be joining us to perform! 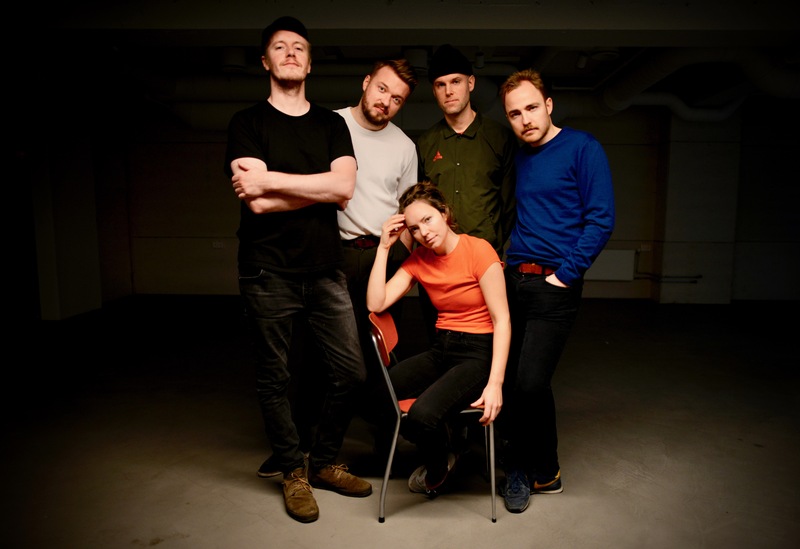 Denmark’s IDA KUDO will be playing, fresh from releasing her Gold EP in November, while Norwegians Hajk will be teasing brand new tunes from their forthcoming album Drama. 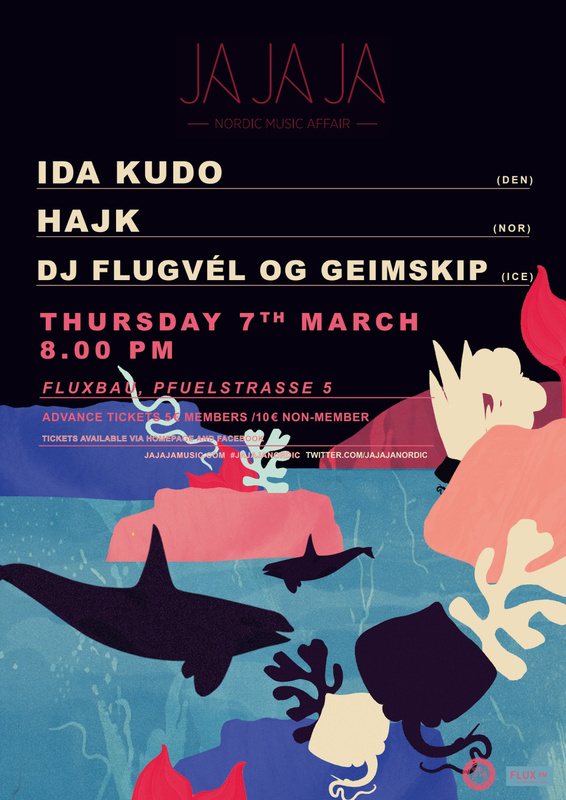 And we’re hugely excited to have Iceland’s DJ flugvél og geimskip coming to Berlin, to bring some cosmic excitement to the room via tracks from her newly released album, Our Atlantis! Intrigued? You should be – read on to get to know each of the artists better! 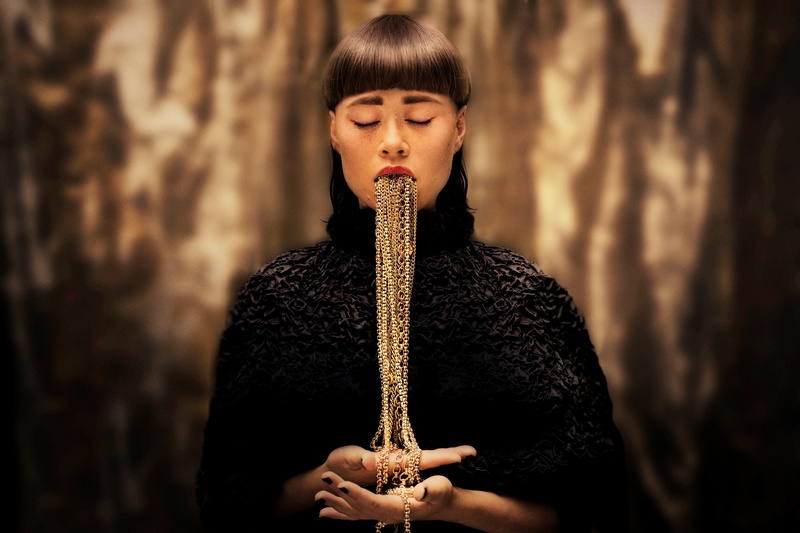 The Danish/Japanese artist IDA KUDO released her latest EP ‘Gold’ on Friday, November 23rd. Throughout the EP she manages to mix and match her mystical, Asian influences and her more cool, Scandinavian style into something entirely new – and she does it perfectly. 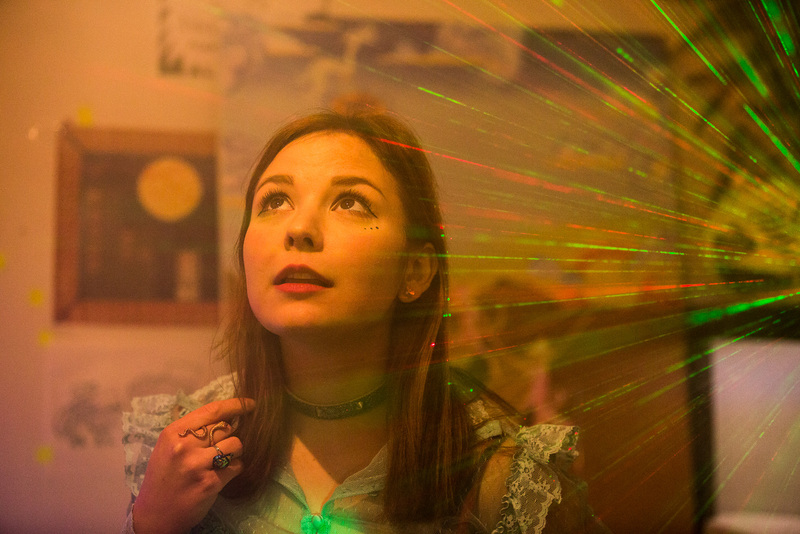 The project is – as Clash said – “dazzlingly original.” KUDO draws the listener into her own universe on this EP – her clear and beautiful vocals, her almost playful lyrics and her sharp production creates this deep, sensual, multi-layered universe, which is entirely her own, and is sure to catch the attention of anyone listening. IDA KUDO has been compared to artists such as M.I.A., Janelle Monae, Bjork and Santigold, and for good reason. Her sound and aesthetic has always been expertly put-together, and on her new EP ‘Gold’ she combines it all with a more mature vision – the project contains everything from huge, dramatic pop-tracks, to more emotional love-ballads and hard-hitting bangers. She’s one of those rare artists, where the sky truly is the limit. IDA KUDO has received a lot of attention in 2018 – she has played at SPOT-Festival in Aarhus amongst other festivals in Denmark, Welcome to the Village in Holland, XPO North in Scotland and at a couple of venues in London. She has received positive press from media in Denmark and regular airplay on Danish radio, but the praise doesn’t stop there – The British BBC Music Introducing, Amazing Radio and Radio Shoreditch have all played her music throughout the year. And so has many German radio stations such as Radio Eins, DLF Nova and two singles broke the Campus Chart last year. She has had articles written about her in Gaffa, Clash Magazine, Kaltblut Magazine, EarMilk, Noisey, Girls Are Awesome + Ja Ja Music among others. Drama – of the interpersonal kind – that’s what Hajk are about on their upcoming album. The band burst onto the Norwegian scene with their self-titled debut album, garnering broad appreciation way outside of their home country. Now, the highly anticipated follow-up is near – a record that both pulls at the heartstrings and urges you to dance. Hajk’s 2017 debut received praise from the likes of Astrid S, Sigrid and Kimbra, as well as a united Norwegian music press. Internationally, outlets such as Noisey, Stereogum, Line of Best Fit, Drowned In Sound, The Independent and Clash Music gave the group standing ovations for their idiosyncratic, yet supremely catchy pop tunes, while likening them to everything from Dire Straits and Aztec Camera to Haim. On “Drama” Hajk embrace their urban influences, naming artists such as Solange, Frank Ocean and Thundercat. With the sophomore album, Drama, a more confident band is on display. Sharpened by more studio experience, they have once again produced the record themselves. Blending analogue and digital sounds, switching between programmed arrangements and live takes from the studio, drawing on three lead vocalists and several guest musicians, Hajk has done whatever necessary to fullfill their creative vision. The title “Drama” relates to the drama of humanity and a somewhat naïve yearning for love in a world in which love sometimes seems scarce. It’s been a while since the band recorded the songs for their debut album, and you can hear that they’re eager to get going. This time they are taking the sound of their debut a few notches further. We get the simple but grand ballads and we get the catchy up-tempo pop songs. In short, drama. Drama will be released by Jansen Records on February 8th , 2019.
dj. flugvél og geimskip (Airplane & Spaceship) is the one-person orchestra of Steinunn Eldflaug Harðardóttir that draws influences from a thousand worlds. Defined as electronic horror-music with a space twist, the music is a mix of playful beats, cool bass, catchy melodies and high pitched vocals. Her live performances are colourful and poetic and her music deals with alien worlds, mysteries, dreams and dangers of the night. Her concerts are like a strange blend of music, horror stories, poetry and theatre. The audience is left feeling like they are in a vivid dream or have travelled to outer space. Many artists are said to “create worlds” with their music, but Icelandic electronic musician dj. flugvél og geimskip takes it upon herself to make those worlds a reality. 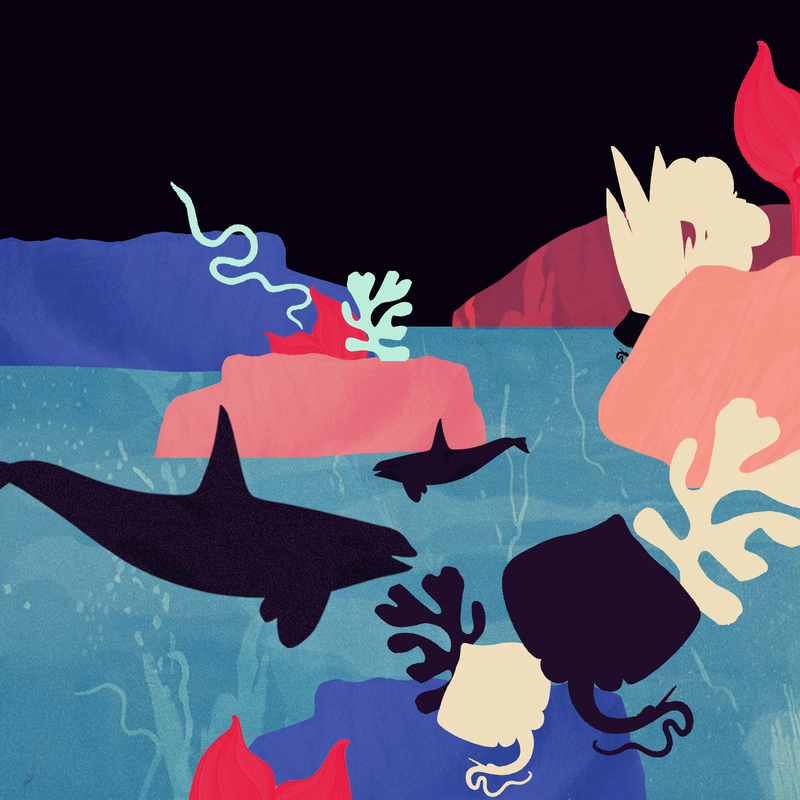 With the release of her new album Our Atlantis via Geertruida, she has shared a 3D world, created by herself, that listeners can explore as they listen to the record – in a sense, a music video designed by the artist and directed by the viewer! This thread of personal empowerment and creative freedom runs strongly through the space horror grooves of Our Atlantis, an electronic album that deftly balances Steinunn Harðardóttir’s genius pop instincts with the wonderfully abstract instrumental flourishes that make her a truly one-of-a-kind artist with an eye and ear for total sensory overload. Recently announced as a tour opener for noise rock sensation Lightning Bolt, named an artist to watch by The 405, and performing a live session for The Current at Iceland Airwaves, dj. flugvél og geimskip is shaping up for her biggest year yet! Join her in a deep dive towards your own personal Atlantis.